Your skin has got to last you a lifetime. It deserves a little pampering and so do you! Improving your appearance, and keeping your skin healthy is what we do. Contact us and give your Skin Aglow! The diamond microdermabrasion tip exfoliates the outer layers of the skin and removes dead skin cells, while gentle suction assists in stimulating the production of new cells in the deeper layers. A micro treatment results in healthier, fresher skin with enhanced elasticity and texture. Removing the mature cells from the top layer of the skin, encourages fresh cells to be produced and pushed to the surface of the dermal layers, resulting in a more youthful appearance. Microdermabrasion is the ideal treatment for anybody suffering with acne, and wishing to experience a more effective exfoliating facial treatment. 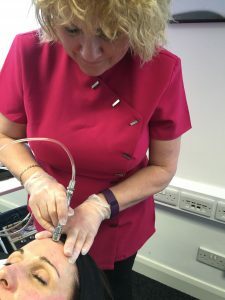 Microdermabrasion can reduce fine lines and wrinkles, refine enlarged pores, eliminate blackheads and whiteheads, and minimise the appearance of scar tissue and pigmentation. So why not book your appointment now? Get instant results from our Luxury Microdermabrasion session – 10 steps to beautiful skin. The session lasts approximately 1 hour, and you will be able to see and feel the benefits immediately. Superficial Cleanse: A mild cleansing to remove any excessive oils, makeup and dirt from your skin. Skin Analysis: Finding out your skin type and checking for any impurities or skin conditions. Deep Cleanse: Removing impurities and helping to soothing any irritations – all tailored to your skin type. Microdermabrasion: Exfoliating the skin, removing dead skin cells, whilst stimulating the production of new cells. Mask: Tailored to you, to help moisturise, firm and brighten your skin. Steam / Hot Towel (optional): Flushes out any remaining impurities. Opens your skins pores ready for extraction. Massage: The most relaxing part of your treatment, helping improve your skin and it’s circulation. Toner: Helping to shrink pores, and restore your skins pH balance and revitalise your skin. Moisturise: Hydrating your skin for a rejuvenated look to your face. Sunblock: Shields your skin from harmful UV rays, preventing premature ageing and enhancing the health of your skin. The standard Microdermabrasion sessions lasts approximately 25 minutes and consists of skin cleansing, followed by Microdermabrasion and finishing with a facial mask and sunblock. Often described as a ‘Lunchtime Facelift’, our standard Microdermabrasion session can be fitted in around you and your busy lifestyle.